Watch King Power Juventus Turin by Hublot in honor of the football club Juventus.The famous watchmaker Hublot has introduced a new model from the Italian soccer club Juventus. 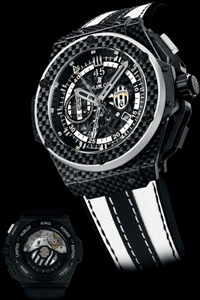 Watch produced in limited edition – 200 copies, have a round case with a diameter of 48 mm carbon fiber. The model is in black and white – the colors of the football club. The dial is in the central part of which is visible work of the mechanism, equipped with central skeletonized hands, date aperture at the 4:00 mark, the time counter at “9:00” and the logo of the football club Juventus have marks 3. On the front side of the case is set sapphire crystal. Watch King Power Juventus Turin are collected on the basis of the manufacturing caliber HUB4245 with two central chronograph hand. One of them is provided to indicate the seconds, and the second refers to the time of 45-minute time in football.